Every fall we go see the Great Forest Park Balloon Race because hot air balloons are just so dang pretty! This year I decided we could make a couple of our to float around the house! Well…they aren’t really floating…but if you use your imagination, you can see them drifting up, up and away! The concept is pretty simple, and you can make this easy or more complex depending on the age of your artist. 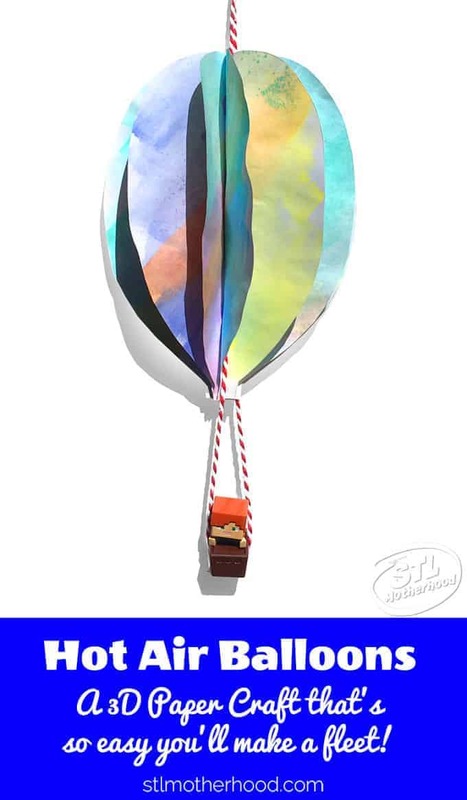 The balloon is made from several folded pieces of paper which are stapled in the middle and then fluffed into a three dimensional shape. 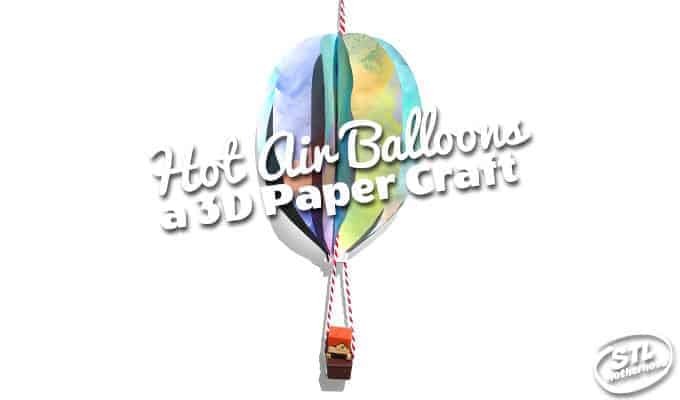 You can make the balloons any color you like–real hot air balloons come in all colors and patterns! 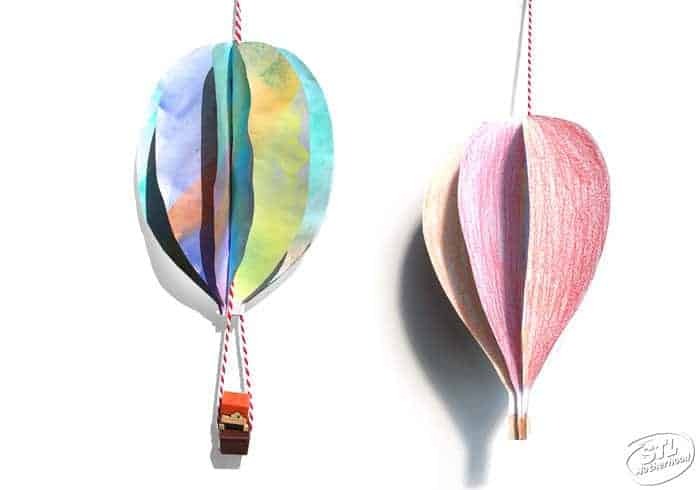 If you’re pressed for time, or want to make a whole bunch, these can be made from colored sheets of construction paper, but it’s most fun when you color it yourself! Kids can use paint or crayons–we found that water colors were super fast AND super colorful. 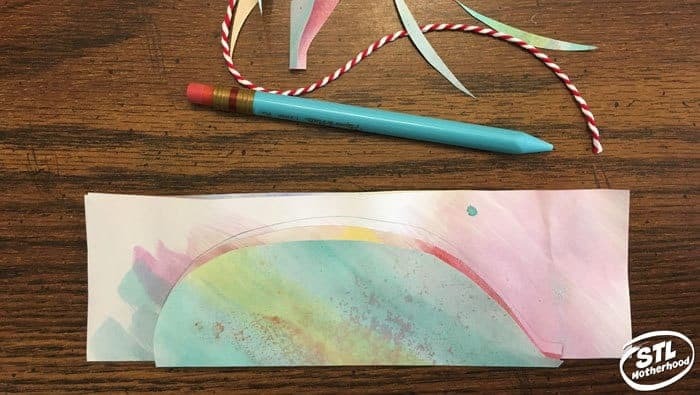 If you’re using paint–or your artist is very young–you’ll want to prep the paper with color first. 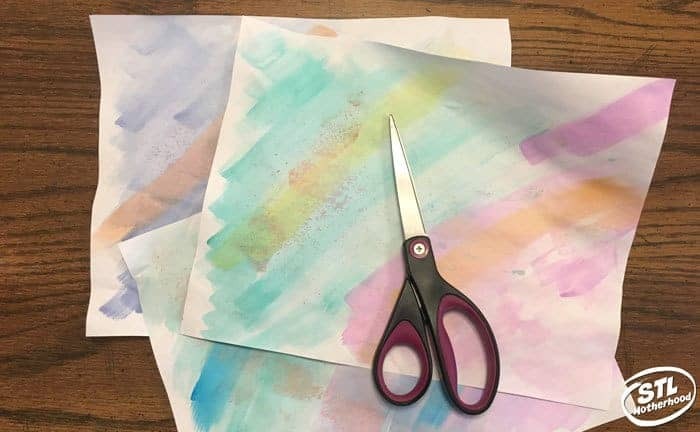 We slapped water color on BOTH sides of three sheets of computer paper. (I’m sure proper water color paper would be even better!) I then hung the sheets to dry outside. Next, cut each sheet in half and fold. 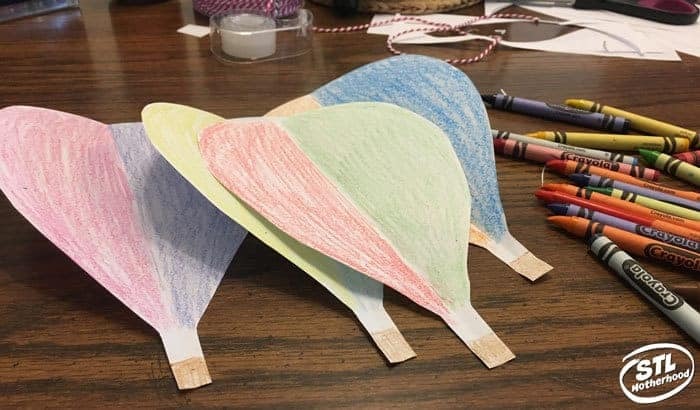 I free-handed a balloon shape on one sheet of paper, then used it as a template to make the other balloon shapes the same size. This one above doesn’t have a basket–we added a Minecraft figure to it later for a pilot. You can see on these crayon balloons we included a pilot’s basket. These balloons were colored AFTER we cut them out…but it doesn’t really matter. 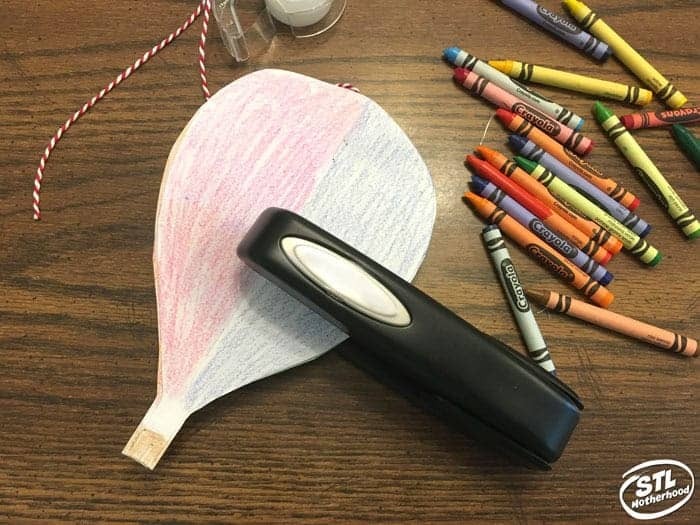 If you want to hang the balloons, add a string to the middle fold of one balloon and tape it in place. Then stack all the balloon cut outs, line them up straight and staple. I stapled our balloons near the top, middle and bottom. Now you just need to refold the balloon shapes until it looks somewhat round! The balloons turn out to be just the right size for this Alex Minecraft mini fig! I doubled the string and taped it on either side of her minecart. Looks pretty good, don’t you think? If you’re in St. Louis and want to see some REAL balloons, the Great Forest Park Balloon Race (and glow!) is September 15 & 16. This year it’s on Art Hill–it hasn’t been there in years, so it’s gonna be an adventure for me too! 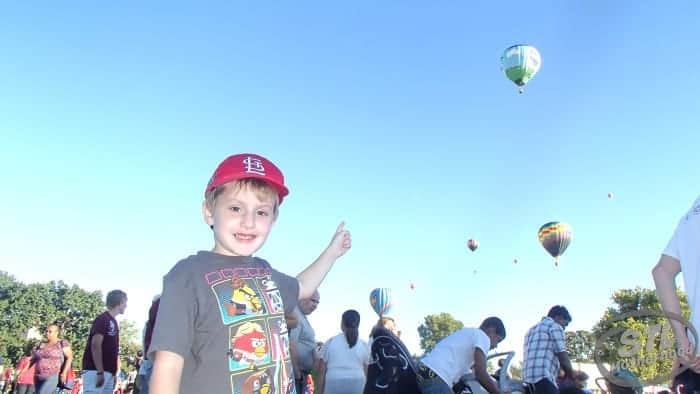 You can read some of my tips on attending the balloon race here. The only thing I expect to change is where we’ll park!